The aging process results in the breakdown of collagen and the underlying tissue that keeps skin looking plumped and youthful. Laughter lines, crow’s feet and other facial lines become more pronounced. Because men have thicker skin and larger bone structure than women, they tend to experience more significant changes and loss of volume in their skin over the years. One of the anti-aging solutions is the use of tissue filler injections which restore the skin’s youthful appearance. Tissue fillers can fill in facial lines and wrinkles by adding volume and hydrating facial tissues, without taking away from the masculinity of your face or altering your features. For an effective, natural way to combat the signs of aging, read on to learn more about the soft tissue filler treatments for men at our Kelowna Skin Care clinic. Where Can Soft Tissue Fillers Be Used? Am I a Candidate for Soft Tissue Fillers? Soft tissue fillers are a very versatile anti-aging treatment and can be customized to treat all skin types and meet many different needs. What Happens During a Tissue Filler Treatment? Treatment with soft tissue fillers is a quick and easy process, lasting approximately 30 minutes. One of our skin-care specialists will carefully inject the filler under the skin to fill lines and help reshape facial contours. Many patients find tissue filler injections painless, though local anesthetic may be used when necessary. Yes. When using tissue fillers for men, it is important to maintain and enhance the masculine features. Our practitioners specialize in natural looking treatments. Which Tissue Filler Should I Use? Juvederm for men is a versatile injectable tissue filler designed to fill in small, vertical lines around the lips as well as deeper nasolabial folds. It can also be used to enhance facial features such as sculpting the cheeks and chin. Restylane range of tissue fillers are used for deep skin hydration, wrinkle treatment and face contouring for men. This soft tissue filler can help restore the volume of your skin, smooth away unwanted facial lines and naturally rejuvenate your appearance. 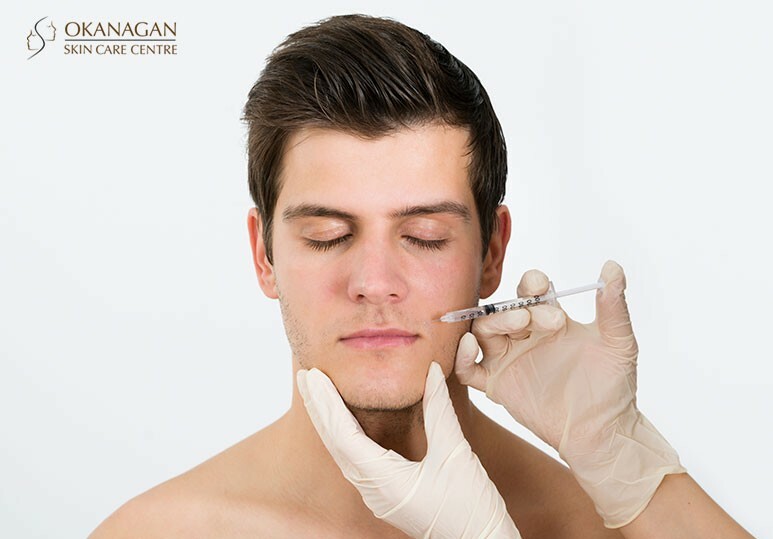 To learn more about our wide range of Kelowna tissue fillers for men, contact our skin care centre today at 250-868-9290 or book a consultation with one of our skin-care specialists.